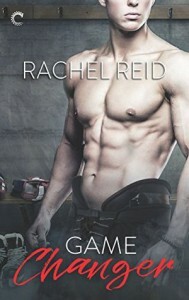 Game Changer is well-written and the characters are interesting. I was impressed that even the secondary characters are engaging and often witty and fun. Considering its length, I was surprised that the story is fairly low on angst. However, I finished this one with a middle of the road feeling. I didn't dislike it, but it didn't leave a big lasting impression either. With Scott being so closeted, I would've expected at least some angst about starting a relationship with Kip, but these guys go from zero to sixty really fast, which leaves a lot of lag time in the story with quite a lot of steamy time. Now, I've got nothing against steamy goodness, and these guys can't keep their hands off each other, but after so much, it becomes repetitive and starts to seem like so much filler. We do finally get some angst as Kip wants more from the relationship, but again, it's fairly low level and it's pretty obvious how it will all play out. It is primarily a feel-good read, but I felt like it needed to be tightened up some. A little less time between the sheets and a little more spent on relationship building could've made a big difference. For me, this was an entertaining read for the most part, but there's really nothing to set it apart from any other book like it. It runs the standard formula of a closeted sports figure meeting Mr Out and Proud. There are no hiccups that we don't see coming, including the sweet and hopeful conclusion. All in all, it's a solid story and I'll be interested to see how this author's work grows with future books.